Since possessing or consuming alcohol under the age of 21 is illegal in the state of Arizona, Minor in Possession or MIP laws are put in place. These laws are designed to discourage underage drinking and thereby reduce the rates of vandalism, disorderly conduct, and driving under the influence. If you are under the age of 21 and are caught with alcohol or have alcohol in your system, you will likely be cited for minor in possession or minor in consumption. Minor in possession (MIP) is one of the most common citations and criminal charges filed against defendants under the age of 21. In Tucson, students from the University of Arizona may be cited by city police, Arizona Liquor Control, or by the UA Police Department. It is not uncommon to see MIP citations alongside other charges, such as possession of a fake or canceled driver's license, DUI, or charges like criminal damage and trespass. There are only two exceptions under which a person under the age of 21 may consume alcohol in public. Arizona Revised Statute 4-226 and 4-249 respectively state that a minor may consume alcohol for medical purposes or religious purposes if it does not interfere with public health or safety. Additionally, in Arizona, unlike in some states, people under 21 are allowed into bars if they are accompanied by a parent, spouse, or legal guardian who is over the age of 21. Using false or borrowed identification to illegally obtain alcohol or to gain entrance to a bar or other business licensed to sell alcohol, is considered a Class 1 misdemeanor offense. These charges are punishable by up to six months in a county jail and a maximum fine of $2,500. If one is convicted of using a fake driver's license to purchase alcohol (as opposed to just being in possession of a fake license), such conviction could result in a suspension of a person's driving privileges. At our firm, we frequently negotiate diversion terms, fight to obtain diversion if the prosecutor is declining to offer it, and assure that the diversion process moves efficient and the prosecutor follow through on his or her end of the bargain. 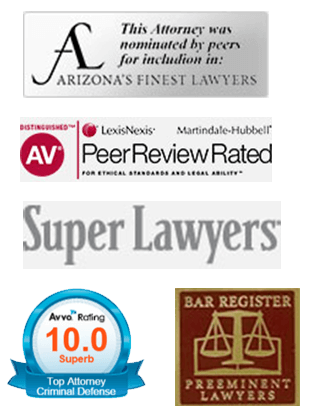 It is important to obtain an attorney experienced in fighting to defend minors. Criminal charges can have long-lasting negative effects on a minor's future career, education, and family life. With over 40 years of combined experience, Attorneys Steve Sherick and Adam Bleier will provide a well-prepared and exhaustive defense. Call them today at 520-318-3939 or contact them online.